There are a lot of things to love about the fall season: cooler weather, beautifully colored foliage, and the kids being back in school! But one of the highlights for most of us is the special foods we look forward to enjoying each autumn. Being honest, we’d have to admit that most of the foods we associate with fall holidays and festivals aren’t very good for our teeth. But did you know there are some delicious Fall foods that are good for you? Here are a few foods that will let you enjoy the warm and cozy feeling of autumn while enhancing your oral health! Apples have long been known for their health benefits, and we all look forward to enjoying these sweet and delicious treats each fall in ciders and pies. But you can do your teeth a favor by choosing to eat your favorite variety of apple in its natural, raw state. Yes, they are high in natural sugars (about 19 grams per apple), but they counteract that by also being high in water content and fiber. When you chew crunchy foods, your mouth naturally produces more saliva, which contains bacteria-neutralizing agents that protect your teeth from decay. Crunchy foods act as nature’s scrubbers on your teeth. They are especially good at getting around and between teeth to clean away plaque and leftover food particles. So throw some apple slices into your work lunch or the kid’s school lunch and reap the healthy rewards of this sweet and yummy snack. When you think of fall foods, one of the first that often comes to mind is pumpkin. 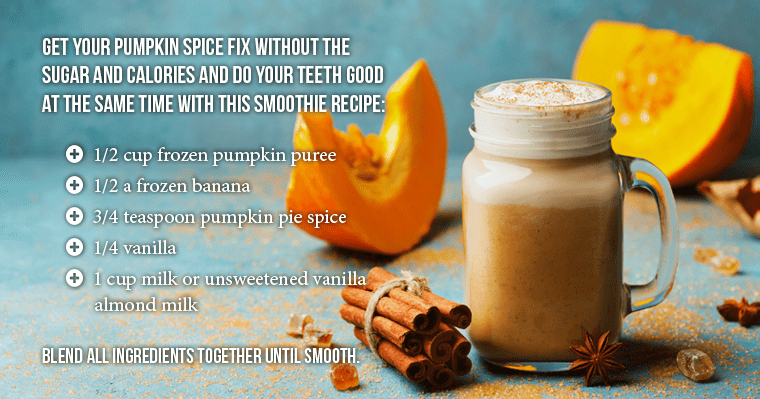 We’ve all seen the stampede at Starbucks for their seasonal pumpkin spice latte; and each fall, Pinterest is inundated with the latest pumpkin recipes. But, you may not know how good pumpkin actually is for you! Pumpkin contains zinc, and a deficiency in zinc is associated with poor dental health, weak bones, and bleeding gums. It has magnesium, which works along with calcium to build a hard enamel surface on your teeth necessary to resist decay. Pumpkin has 100% of your RDA for Vitamin A for promoting healing, especially important if you have damaged gums. It provides 20% of your RDA for Vitamin C, needed to build up your immune system and fight off infections and inflammation. It is also a rich source of beta-carotene, which can play an important part in fighting several types of cancers. As you can see, pumpkin is a vegetable superfood when it comes to your teeth, so eat up! 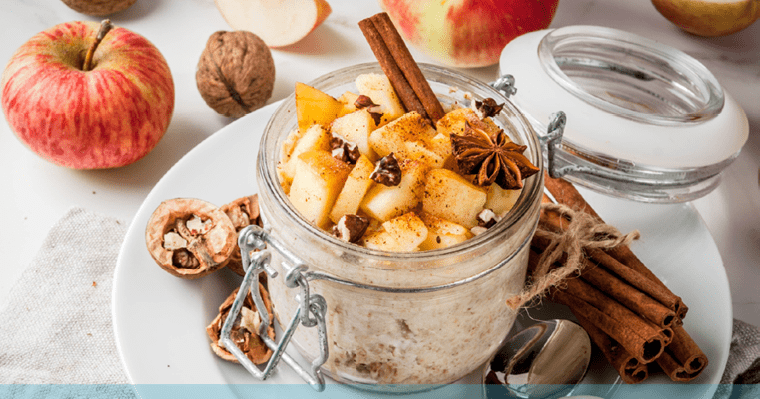 But skip the sugary lattes and opt instead for the soups, oatmeals, quick breads, and smoothies featured in these healthy and tasty recipes. Blend all ingredients until smooth. Enjoy! Pumpkin seeds are packed with nutrients, too – especially fiber (there’s more than 5g in 1oz of pumpkin seeds) and phosphorus, along with protein, calcium, and iron. Tooth enamel is made of calcium and phosphorus, so eating foods rich in these minerals will help to keep your teeth strong. And iron helps to keep your tongue healthy. Most nuts and seeds are high in protein and low in sugar, while also providing great vitamins. So next time you are carving a pumpkin, why not try roasting the seeds and harvest the rich nutrient dividends for you and your family! Cranberries are another seasonal snack good for the health of your teeth. They contain polyphenols that act as a bacteria repellant, blocking the molecules from sugar-causing bacteria from forming a decay-causing sticky layer on your teeth. Cranberries also encourage the good bacteria in your mouth to thrive! Because cranberries are naturally tart, many times cranberry products are loaded with sugar, so use only unprocessed cranberries or 100% juice with no added sugars. A hot mug of cranberry juice spiced with cinnamon, orange zest, and cloves is the very essence of fall! Making healthy choices is easier when we know why they are important and how they will benefit us. Hopefully, this look at healthy fall food choices and how they will benefit your teeth and oral health will help you to make wise choices for you and your family. And we hope you will try some of the recipes we’ve shared! Let us know in the comments below which recipes your family enjoyed the most!